Monteriggioni can still be admired as it once was: a medieval castle surrounded by fortified walls and towers at the top of a hill just outside Siena. Starting Marzo 30 and up until October 31, 2013 the local promotion board is offereing guided visits of the castle of Monteriggioni as well as a short hike along the via Francigena, the ancient road that took pilgrims to Rome. The tours are offered in both English and Italian. The guided visit to the castle lasts 1 hour and is open to a maximum of 45 people at each turn. You must book ahead of time, by 5pm of the day before the day you want to participate in the tour. The tour costs € 8 (free for kids under 12 years old and disabled visitors). 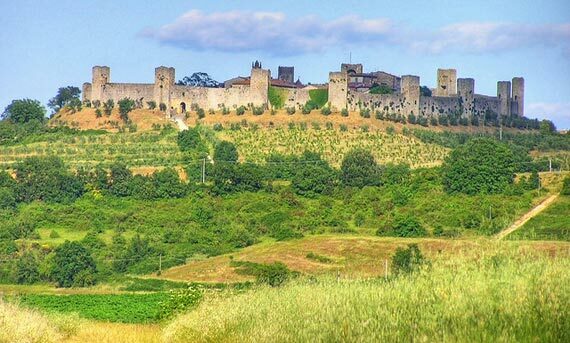 The hiking itinerary is a guided walk of about 4 km along the Via Francigena from Monteriggioni to Abbadia Isola, and includes the visit the the Romanesque church at Abbadia as well as a shuttle bus back to Monteriggioni. Upon return into Monteriggioni, participants then visit the castle as indicated above. The hike and visit lasts about 2 hours. Reservations need to be made by 5pm of the day before you wish to participate and costs € 10 (free for kids under 12 years old and disabled visitors). Guests staying at any lodging within the walls of Monteriggioni, with the Tourist Card in hand (request it at your lodging), will be able to participate in the walk and/or guided visit of the castle for free, as long as booking is made as detailed above. You can book and pay for your visit or hike directly at the Tourism Office in Monteriggioni, located in Piazza Roma 23 (face the church, the office entrance is to the left of the church). Reservations (required) can also be made by phone by calling 0577 304834. There are various days for the visits and walks in the next few months. In April, May, June, September and October – guided visits are every FRIDAY, SATURDAY and SUNDAY. The walk is only offered on SUNDAYS. In July and August – guided visits to the castle will be offered all week long, MONDAY through FRIDAY; the walk only on SUNDAYS. On April 25 and May 1 – guided visits will be offered at these times: 10am, 11.30am, 3pm and 4.30pm.